My goal is to buy or sell your property in a way that respects all parties involved while maximizing opportunities for you. This guiding principle plus knowledge is the reason I have had the chance to walk alongside the same clients for many years as they have changed their life patterns and housing needs. Representing my clients is an honor I take seriously and I take great care to manage each relationship efficiently, competently and with compassion. It is all about your timeline, your needs, your wish list, your schedule. I am there for you in the beginning, the middle and the end connecting you to the different parts of the transaction-- the preparations, the financing, the searches, the pulse of the market, the title company, the emails and phone calls, the signings, the offers, the addendums, everything. Born and raised in Montana, I grew up the eldest in a large family. I received my BA and MA from the University of Montana in Missoula and followed with service as a Peace Corps Volunteer in Malaysia. I was a public high school teacher in NYC and then a High School Assistant Principal in Billings, Montana. 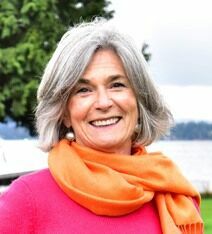 Since 1985 I have lived and worked in Seattle starting as the owner of several local branches of the Great Harvest Bread Company, raising my children (and now grandchildren) in the public school system and volunteering as an active member of the Laurelhurst Community Club. I have been a Windermere realtor since 2005 and enjoy this work immensely, balanced with time “off the grid” and at a special place in McCall, Idaho. These experiences are the roots of who I am. The responsible older sibling, the socially conscious volunteer, the open minded teacher, the risk taking entrepreneur, the community building neighbor, the hardworking real estate agent on your side. "I get to touch peoples lives with what I do. I am good at this and want to share it with you.” – from the movie Chef (2014). I hope to have the chance to share in your life through finding a new future or saying goodbye to the past, will you share your story with me? "She was always available to answer questions, understood our situation well, found the right 'arranger', and gave us excellent practical advice."